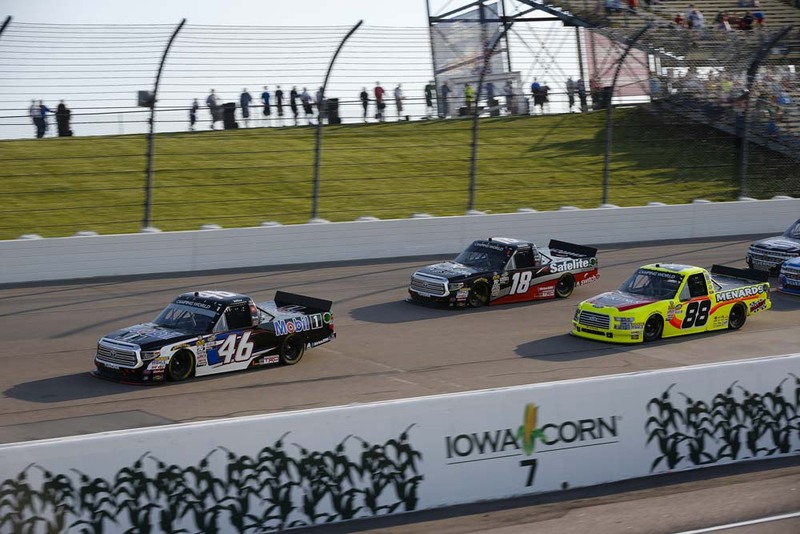 Christian Eckes was battling for a spot inside the top 10 in the early stages of Saturday’s M&M’s 200 at Iowa Speedway when contact from another competitor sent him spinning entering Turn 3. Eckes was able to avoid contact with the inside wall and the Mobil 1 Racing team would recover nicely as the 17-year-old driver became more and more comfortable throughout the race. In the end, the talented youngster would end the day with a respectable eighth-place finish in his NASCAR Camping World Truck Series debut. Eckes posted the ninth fastest time in the final round of Saturday afternoon’s qualifying session. With the outside lane being the preferred lane, the Mobil 1 Tundra would fall back to the 12th position five laps into the race and was scored 11th when the first caution of the race occurred on lap 24. Shortly after the field went back green, the young driver found himself in a four-wide battle for the 10th position and got clipped by another competitor. The Mobil 1 Tundra went spinning into Turn 3 but was able to avoid contact with the wall or other oncoming competitors. After hitting pit road for four fresh tires and full load of fuel, Eckes restarted from the 21st position on lap 37. He quickly began moving forward, moving into the 14th spot on lap 40 and then returned to the top 10 on lap 56. The New York native remained 10th when the field completed Stage One on lap 60. Having already pitted for tires once, crew chief Cody Glick kept his young driver on the track between stages. When the leaders pitted, Eckes inherited the top spot and would lead the field to the start of Stage Two on lap 68. With the rest of the field having fresh tires, Eckes lost several positions in the opening laps of the stage. He had subsided to the 17th spot just 12 laps later and was 16th when the fourth caution of the race occurred on lap 103. Glick summoned his young driver to pit road for four fresh tires and fuel. Eckes would restart 16th when the field went back green on lap 116. The 17-year-old driver would gain two spots over the next four laps to finish 14th in Stage Two. Having pitted at the end of Stage Two, Glick elected not to pit between stages, which allowed the Mobil 1 Tundra to restart from the eighth position when the Final Stage went green with 73 laps remaining. A strong restart from the outside lane helped Eckes move up to the sixth position one lap later. On lap 133, Eckes moved into the fifth position, where he remained when the field was slowed for the sixth and final time on lap 136. With just one set of sticker tires remaining it was too early to pit for the final time, so Eckes would take the lap-144 restart from the fifth position. The Mobil 1 Tundra fell back to the seventh spot with 50 laps remaining and lost one more position with 40 laps to go. Eckes would settle into the eighth position for the final 40 laps of the race and bring home a top-10 finish in his Truck Series debut. How did your Truck Series debut go? Brett Moffitt collected his second NASCAR Camping World Truck Series victory of 2018 and the third of his career. Noah Gragson finished 0.333 seconds behind Moffitt in the runner-up position. Harrison Burton finished third while David Gilliland and Johnny Sauter rounded out the top-five finishers. The race featured six cautions for a total of 44 laps. There were seven lead changes among seven drivers. Eckes led once for four laps. Eckes will be back behind the wheel of the No. 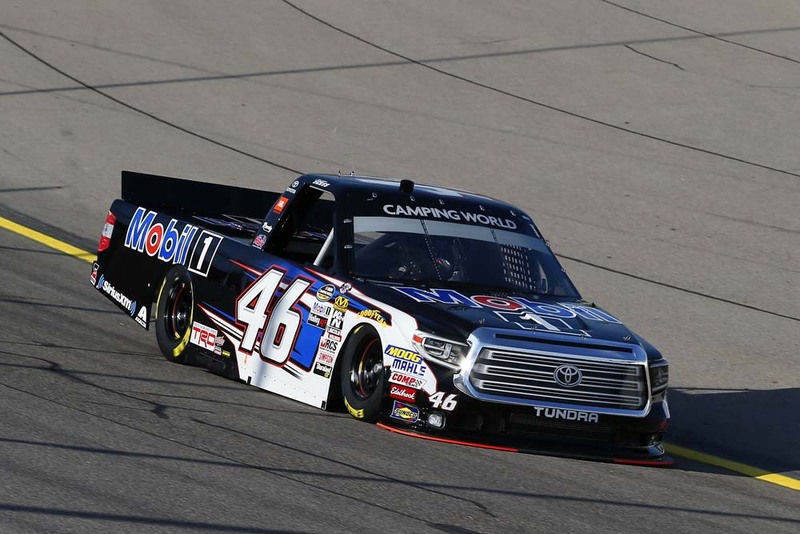 46 Mobil 1 Tundra when the Truck Series resumes action June 23 at Gateway Motorsports Park in Madison, Ill. Live coverage of the Eaton 200 begins Saturday at 8:30 p.m. ET on FS1.